“All good cooks of this one opinion: no dish savory without an onion.” We forget now the exact provenance of that centuries-old saying, but we agree heartily (or at least one of us, the one who was not as a small child fed onion juice and whiskey as a cough syrup, does). Little by little seed catalogues are starting to acknowledge the crucial but for long unpublicized fact that you cannot grow any onion anywhere. The broad division is into “short day” and “long day” types, because onions are day-length-sensitive (or, in truth, night-length-sensitive). The plants sense the length of the day (or, again, actually of the night) and use that datum to “decide” when to do what in their plantly lives. The two types differ not only in daylength sensitivity, but in culinary and keeping qualities. The long-day onion class (also called “American”) is substantially stronger-tasting, and also is of very much better keeping quality than the short-day (or “European”) sort. The common apprehension that short-day types—such as the famed Vidalia—are “sweeter” is quite wrong: they are milder—less pungent—which is not at all the same thing; in fact, the long-day types have more actual sugar, and in consequence actually cook up sweeter (cooking minimizes or reduces the sulfur compounds that give onions their pungency). Connoisseurs (we will strive mightily to avoid the buzzword gourmet) apparently attach real significance to particular varieties of onion (Nero Wolfe, passing through his kitchen, takes a nibble of a raw onion his cook is slicing and asks “Ebenezer?” implying that a discriminating palate can tell one variety from another from but a taste, rather like a wine). But meaningful, realistic flavor comparisons between particular cultivars of onion is essentially nonexistent (there is plenty and plenty of published evaluation, but none we have seen rises to the level of “meaningful, realistic”). But we can at least deal in generalities about the types. Another profoundly important datum is keeping time: the yellow/browns keep very much longer than do the reds (the browns keep longest of all). That is important when one is growing one’s own instead of picking up a new supply at the supermarket every week. 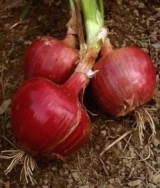 The best-keeping browns can, some say, under ideal conditions last close to to a full year, or at least till close to the time when “baby” onions can be taken from the next crop; the longest-keeping reds can go into the following spring or, it is said of some, even early summer. Note that we deal here only with open-pollinated cultivars. Ask a lot of gardeners about long-keeper onions and you will often hear Copra (brown) and Redwing (red), both hybrids. But the OP types we discuss here are usually thought to be just about as good, both as to keeping qualities and as to ceating quality. There is also a charming onion sub-class called “buttons” or, more commonly, by their Italian name, cippolini. These are not “pearl” or “cocktail” onions; they are smaller, and quite delightful. They are said by some to be hard to grow, but if you have space are worth trying for fun. Massive review of the literature available on the web and on usenet suggests that the best yellow/brown “keepers” are Clear Dawn (an open-pollinated derivation from the hybrid Copra, widely known as a very long keeper) and Australian Brown (scarce but available, and possibly as good as or better than Clear Dawn). There is also the Pukekohe Longkeeper (apparently now re-named Creamgold), colorably the best keeper of them all, it’sbut only available in New Zealand or possibly Australia. We’d say that the thing to do is plant equal amounts of Australian Brown and Clear Dawn and see, a year later, which produced well, kept the best overall, and tasted good. (We ourselves won’t be doing that this year, as we are just coming back on line to serious gardening and can only take on so many veggie types at once— we’ll just go with Clear Dawn.) But the Australian Brown should certainly thrive up here: numerous Canadian seed catalogues, most from Alberta or Sasketchewan, praised it thoughout the 20th century. And the Clear Dawn is being grown in interior British Columbia. Rossa di Milano: everyone says “sweet” and “tolerates cool weather well” and keeps quite well— some say into the next spring and perhaps till May or even early June, though it’s seedsmen who say so. Probably best red keeper now available, unless it’s the one below. Some describe it as “hot” (though mildly so). Red Wethersfield: an old standby (Thomas Jefferson grew it), “fine pungent flavor”. Once actually used as currency in the town of Whethersfield, Connecticut. So if you want to mix in some red onions, we’d go with Rossa di Milano and, if space is plentiful, trial-mix in some Red Wethersfield. Despite the fact that the Italian onion type called “cipolinni” (literally, “little onions”) is often compared to what in the U.S. are known as “pearl onions”, the differences are significant. “Pearl” onions are any white (or even yellow) onion harvested when still pretty small; cipolini are a particular kind of onion (a long-day, long-keeping type) with a distinctive set of qualities. They will not be a large fraction of anyone’s onion crop, but they are a pleasing specialty with many virtues and should be included in any vegetable garden. Here’s a link to a University of West Virginia trialling of some cipollini types. Regrettably, the apparently quite superior Di Genova red is no longer available in the U.S. The potato onion is reputedly a superb “keeping” onion (and the only good-keeping onion that can be grown in short-day latitudes, which is about the southern 2/3 of the U.S.). It is just a little smaller than the standard bulb onion (running from 2 to 4 inches in diameter), but still eminently useful. Their flavor, especially, is described as rich and good but not as strong as that of the standard bulb onion—indeed, they are very close cousins to the shallot, also grown chiefly for its delicacy of flavor (but shallots are much smaller, like large garlic cloves). There is a nice short summary about them from the University of Wisconsin available on line; but it propagates a very common and serious mistake about potato onions that we need to address right now. The offending line is “Select and save the biggest and best bulbs for replanting in the fall.” Since this type can sometimes be quite small, one would think that good advice, but it’s not. The curious rule with these is apparently: Planting a small bulb gives a single big-bulbed plant; planting a big bulb gives a cluster of small bulbs. Many first-time growers, unaware of that, do just what that brochure says, then are vastly disappointed by the small bulblets they grow out. Keep enough going that every year you have a mix: small bulblets planted to give you your eating onions, and some big bulbs planted to give you your next season’s small seed bulblets. The discussions below are entirely about standard bulbing onions. For cultural information on potato onions beyond what appears above, just follow the directions pertaining to shallots, except to perhaps increase the planting spacing to 6" or so. These are actually a distinct sub-species, now classed as Allium x proliferum (formerly variously classed Allium cepa var. proliferum, Allium cepa var. bulbiferous, or Allium cepa var. viviparum) from the other onions we discuss here (which are plain Allium cepa). They are a cross between Allium cepa, the ordinary cultivated onion, and Allium fistulosum, the so-called “Welsh onion” or scallion (see our page on scallions. For these, the edible portion is not an in-ground bulb, but rather “bulblets” that set in clusters at the tops of the stalks. 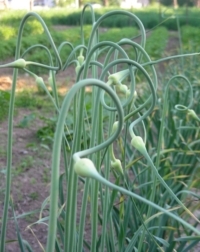 There is a ton of information about these at The Egyptian Walking Onion web site (a commercial grower), including numerous photos. Another wonderful resource is the University of Wisconsin’s Egyptian Walking Onions psge. If all else we plan for onions works, we probably don’t need these, but they make a nice novelty and reportedly are both very hardy (they will grow up through snow) and prolifically productive. While there are identified cultivars, almost all seedsmen handling them sell them as generics; what is said to be an “improved” strain is called Catawissa, a red/brown type supposedly a little hardier and more productive than the original. (Though “hardier” is hard to conceive!) The famed William Woys Weaver says that this strain is “somewhat different from the others because they send up topsets from topsets, creating the image of plants growing out of plants. These hybrids are strong growers, often attaining 4 or 5 feet in height, and always in need of staking as a precaution against heavy summer rains.” There is reportedly also a Red Catawissa cultivar. Good luck finding plausibly identified cultivars from the seedsmen (Territorial appears to offer something that might be that Catawissa Red; others have it for sure). This discussion is only about standard garden bulb onions; for any other kinds, look up their specific requirements. Best results, in quantity and quality, are from onions grown from seed, not from “sets”. But beware: onion seeds are notoriously short-lived. If you aren’t saving you own seed annually, don’t try to be cheap and use last season’s leftovers—get fresh seed every year. Onions from seed can be handled as indoors-grown seedlings transplanted out, as as direct-seeded. If you opt to direct-seed, which certainly saves a lot of fuss, you need to practice “winter sowing”; the High Mowing Seeds site has a nice description of the winter-sowing process, which we will not repeat here: just follow the link (then scroll down the page a bit, to the heading My favorite method: Planting onion seeds via winter sowing). Basically, it reproduces how onions grow in nature, and is how we will go about it. Onions grow by first developing their “tops” (above-ground greens), then—when triggered by daylength—setting their bulbs. When they begin to set the bulbs, the tops stop growing. There are two utterly vital points involved here. Rule: an onion plant’s bulb will never be bigger than its top. Corollary: grow tops as big as you can get them before bulb formation is triggered. That’s why we transplant them “as soon as your soil can be worked”. Again: the fine folks at High Mowing Seeds have laid it all out nicely: just follow their instructions. Onions prefer a sunny, sheltered position in loose, well-drained soil of high fertility with plenty of organic matter worked in. Onions are sensitive to highly acid soils, and grow best when the pH is between 6.5 and 6.8. Space onions at about 4 inches; having a deep-dug or raised bed is good for them, as for all vegetables. Onions crowded too tight will not develop well. “Hot” (harsh, overstrong) onions are usually a result of insufficient watering. Onions have a shallow, meager root system, and need their soil kept continually moist (but not flooded!). They want light but frequent watering—a soaker hose should work well. 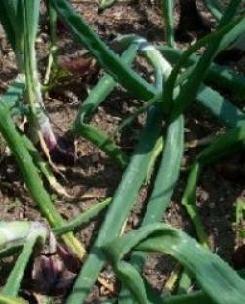 Onion beds need to be kept very well weeded, because weeds easily out-compete onions for water and nutrients, owing to onions’ weak root system. But, also because of that shallow, weak system, be sure to cultivate shallowly with a careful hand and eye, lest you harm the onions themselves. Since weeding will get you up close and personal with your onions, use the opportunity to keep a close eye out for any flower stalks that might appear—they shouldn’t, but they might. If you see any—search out and check some photos for positive identification—just pinch them off at the base (else your onion will bolt and be useless). While onions like rich soil, avoid using any high-nitrogen based liquid fertilizers when your onions are well along, lest their growing efforts go into their leaves instead of their bulb. Pull onions when the tops have gone brown and fallen over. Some gardeners break the tops and push them over to try hastening development, but that should not be necessary and may be a bad idea; just grow them and let them do their thing. Don’t puncture them in extracting them from the soil. After pulling them, let them dry in the sun for a day or so, then cure and store them as you would garlic or shallots. 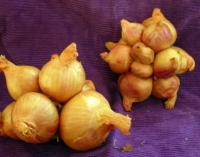 Onions are of the Alliaceae family, the alliums (till recently called the Lilliaecae family). Besides such obvious relatives as leeks, scallions, and garlic, the onion’s kin include lillies and hyacinths. We won’t try to re-invent the wheel; here is an excellent on-line history of onions. If you’re here, you probably like onions; but if you don’t, you can look in on the Official Facebook page of the Anti-Onion League. It was last modified on Tuesday, 12 February 2019, at 19:17 EST.